You may have heard media reports on the contract negotiations, or lack thereof, at Wright State University. If you have not, negotiations have gone poorly and a strike appears imminent. On November 7, Wright State AAUP members voted to reject a fact-finder’s report: of the 493 eligible to vote, 97.2% voted, and 97.5% of those who voted rejected the Fact Finder’s report. Wright State does have real budget problems, but they are self-inflicted. Over just four years, the Wright State board and administration have wasted $130 million on initiatives and “enterprises” unrelated to the core academic mission. Wright State’s full-time teaching faculty constitute a small percentage (17%) of the university’s budget. This has been consistent over the last ten years. Wright State also has had a net loss of 92 full-time faculty since 2016. So, spending on faculty has clearly not created the budget problem, and it is unrealistic to expect the problem to be solved through draconian cuts to faculty positions and salaries. Unfortunately, the University of Cincinnati has seen some of these same problematic trends. Cuts in state funding have created serious budget issues. But here, as at Wright State, instead of refocusing on the core academic mission of teaching and research, the UC administration has diverted resources to a myriad of non-academic areas. This includes the seemingly never-ending practice of hiring more and more administrators. The increase in administrators has been accompanied by a reduction in the number of full-time faculty (or a lack of new hires to meet the demands of increased student enrollment). In many academic units at UC, the number of full-time faculty is no longer sufficient to maintain the quality of UC’s academic programs. Further, UC administration’s increasing overreliance on adjuncts is a Band-Aid solution that is not sustainable and is again damaging the quality of UC’s academic programs. The UC administration has attempted to cloak the shift in funding away from the academic mission with Performance Based Budgeting, commonly referred to as PBB. They can give it any name they want, but it is as a shift in funding away from teaching and research, and it is negatively affecting the core academic mission at UC. 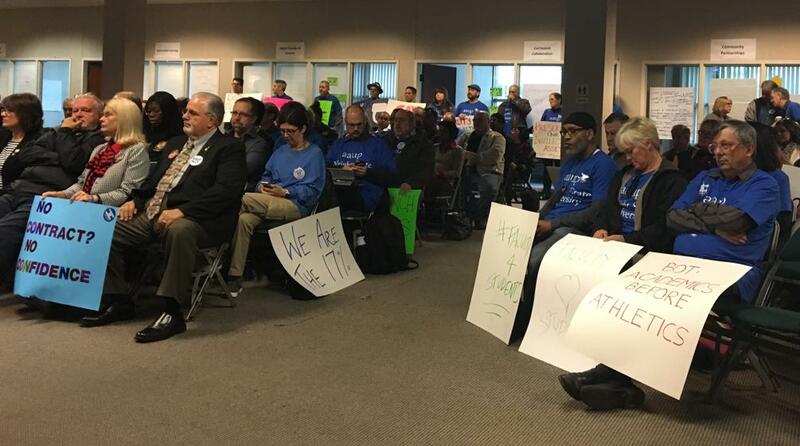 Returning to Wright State, the faculty and Wright State AAUP chapter recognize the financial problems at that university and are willing to be a part of the solution. They object that the people who created the mess are now trying to gut the faculty by using the mess that they created as a justification. Wright State is scheduled to strike on January 22nd. You can sign a petition of support https://actionnetwork.org/petitions/stand-with-wright-state-faculty.